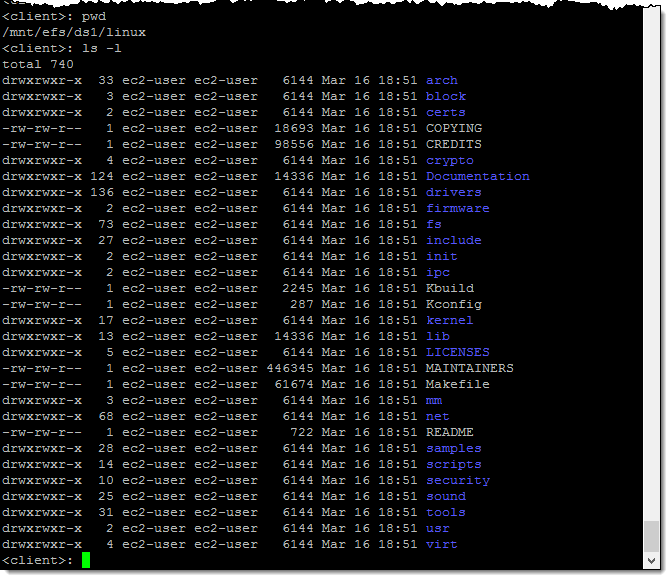 This is the second post in a series showing how to use Docker volumes with Amazon ECS. If you are unfamiliar with Docker volumes or REX-Ray, or want to know how to use a volume plugin with ECS and Amazon Elastic Block Store (Amazon EBS), see Part 1. In this post, you use the REX-Ray EFS plugin with Amazon Elastic File System (Amazon EFS) to persist and share data among multiple ECS tasks. To help you get started, we have created an AWS CloudFormation template that builds a two-instance ECS cluster across two Availability Zones. The template bootstraps the REX-Ray EFS plugin onto each node. Each instance has the REX-Ray EFS plugin installed, is assigned an IAM role with an inline policy with permissions for REX-Ray to issue the necessary AWS API calls, and a security group to open port 2049 for EFS. The template also creates a Network Load Balancer that is used to expose an ECS service to the internet. 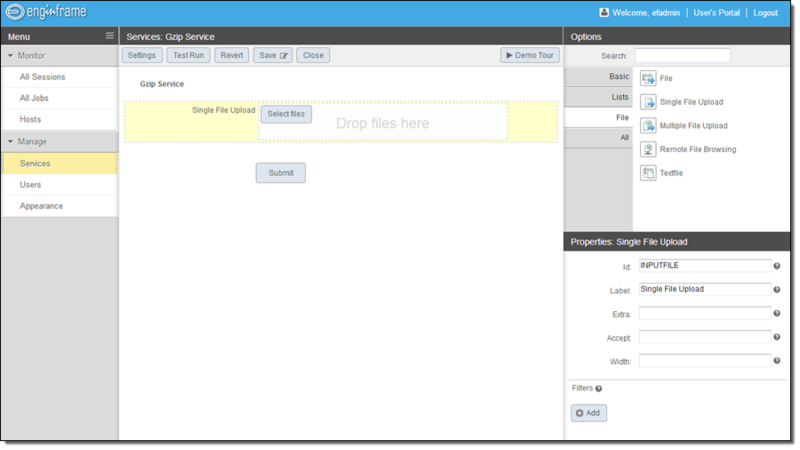 First, create a folder in which you create all files and enter it. 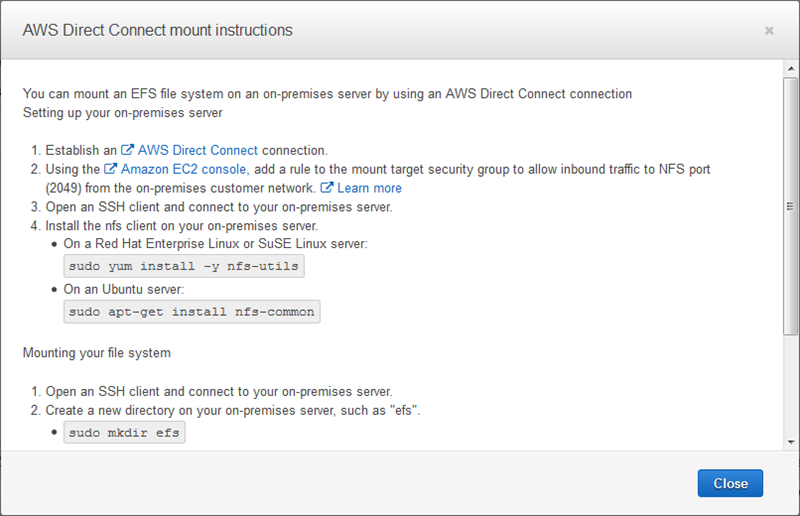 Next, set the full path for your EC2 key pair that you need later to connect to your instance using SSH. This shell script exports the output parameters from the CloudFormation template. With the following command, import them as OS environment variables. Later, you use these variables to create task and service definitions. echo "usage: source <(./get-outputs.sh  )"
echo "stack name or ID must be provided or exported as the CloudFormationStack environment variable"
echo "region must be provided or set with aws configure"
echo "please provide stack name or ID"
echo "#Checking if stack exists..."
echo "#Checking if stack creation is complete..."
echo "#Getting output keys and values..."
In this step, you create a task definition for an Apache web service, Space, which is an example website using Apache2 on Ubuntu. The scheduler and the REX-Ray EFS plugin ensure that each copy of the task establishes a connection with EFS. Because autoprovision is set to true, the Docker volume driver, rexray/efs, creates a new file system for you. And because scope is shared, the file system can be used across multiple tasks. In this step, you create a service definition for the rexray-efs task definition. An ECS service is a long-running task that is monitored by the service scheduler. If the task dies or becomes unhealthy, the scheduler automatically attempts to restart the task. The web service is fronted by a Network Load Balancer that is configured for forward traffic on port 80 to the tasks registered with a specific target group. The desired count is the desired number of task copies to run. The minimum and maximum healthy percent parameters inform the scheduler to run only exactly the number of desired copies of this task at a time. Unless a task has been stopped, it does not try starting a new one. 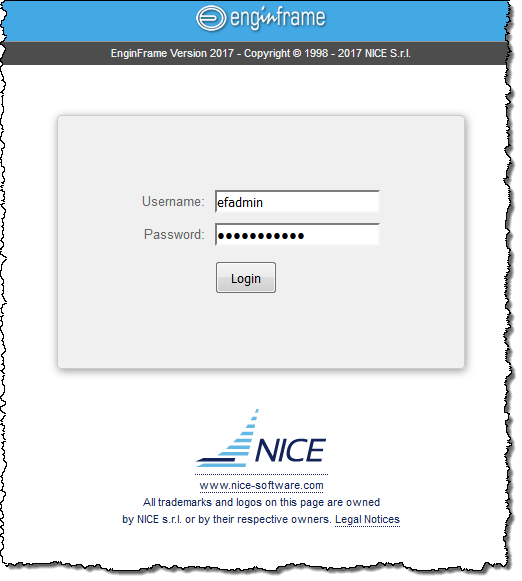 Now, open a browser and paste NLBDNSName as the URL. If you refresh the page, you can see that the task ID and EC2 instance ID change as the traffic is being load balanced. To see the update, refresh the load balancer webpage. To clean up the resources that you created in this post, take the following steps. Delete the mount targets and file system. Delete the CloudFormation template. This removes the rest of the environment that was pre-created for this exercise. Congratulations on getting your service up and running with Docker volume plugins and EFS! You have created a CloudFormation stack including two instances, running the REX-Ray EFS plugin, across two subnets, a Network Load Balancer, as well as an ECS cluster. You also created a task definition and service which used the plugin to create an elastic filesystem. We look forward to hearing about how you use Docker Volume Plugins with ECS. AWS has achieved Spain’s Esquema Nacional de Seguridad (ENS) High certification across 29 services. To successfully achieve the ENS High Standard, BDO España conducted an independent audit and attested that AWS meets confidentiality, integrity, and availability standards. This provides the assurance needed by Spanish Public Sector organizations wanting to build secure applications and services on AWS. The National Security Framework, regulated under Royal Decree 3/2010, was developed through close collaboration between ENAC (Entidad Nacional de Acreditación), the Ministry of Finance and Public Administration and the CCN (National Cryptologic Centre), and other administrative bodies. EFS File Sync uses a secure, highly parallel data transfer mechanism that can run up to 5 times faster than the tools I mentioned above. 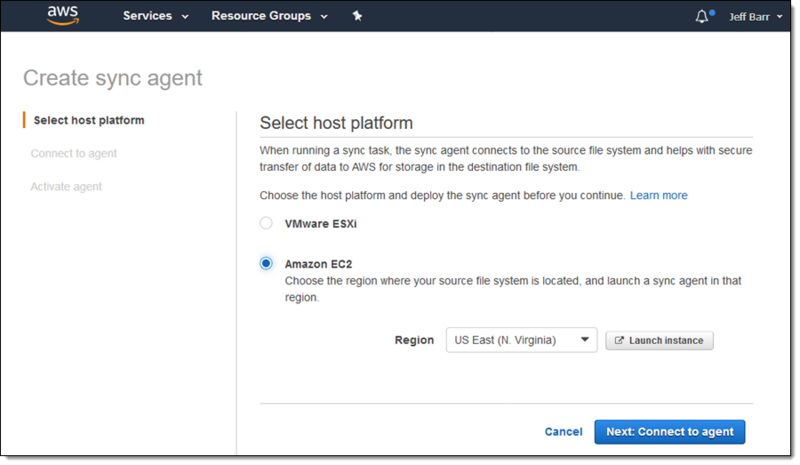 It is available as an agent that runs within VMware ESXi or on an EC2 instance, and accesses the source file system via NFS (v3 and v4), and can be used in all AWS Regions where EFS is available. Because the agent is responsible for initiating all communication with AWS you don’t need to set up VPNs or allow inbound connections through your firewall. 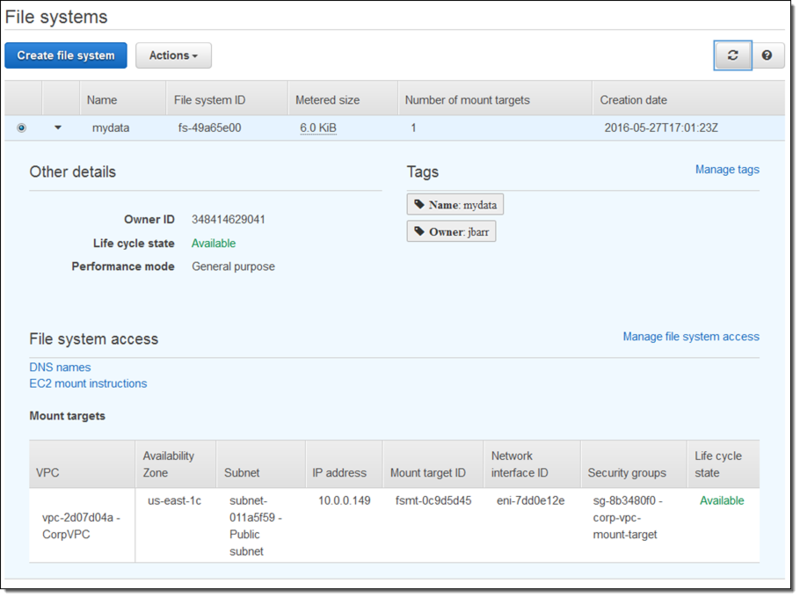 You can launch, control, and monitor the agent and your sync tasks from the AWS Management Console. Jobs can specify the transfer of an entire file system or a specific directory tree, with the option to detect and skip files that are already present in the destination. File metadata (modification and access time, POSIX ownership and permissions, symbolic links, and hard links) is also copied. In order to write this blog post, I launched an EC2 instance, exported an NFS file system (/data), and populated the file system with the Linux kernel source code. 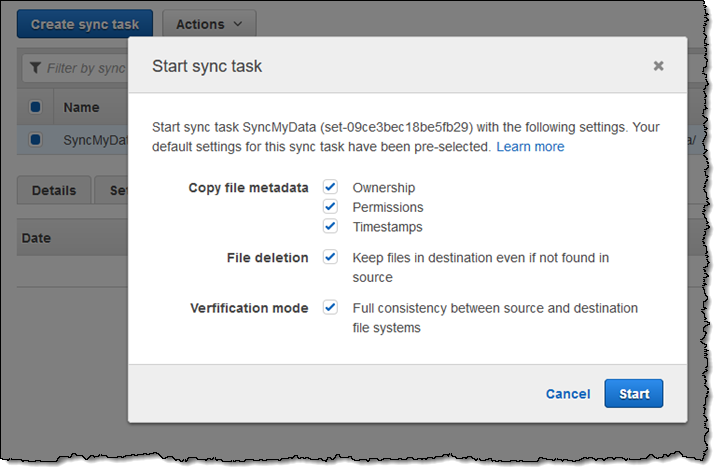 EFS File Sync is available in all AWS Regions where EFS is available. You pay for the EFS and EC2 resources that you consume and $0.01 per GB of data copied (see the EFS Pricing page for more info). AWS has completed its 2017 assessment against the Cloud Computing Compliance Controls Catalog (C5) information security and compliance program. 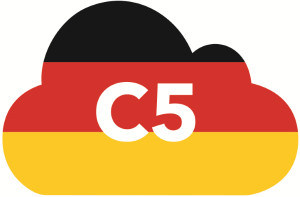 Bundesamt für Sicherheit in der Informationstechnik (BSI)—Germany’s national cybersecurity authority—established C5 to define a reference standard for German cloud security requirements. With C5 (as well as with IT-Grundschutz), customers in German member states can use the work performed under this BSI audit to comply with stringent local requirements and operate secure workloads in the AWS Cloud. The English version of the C5 report is available through AWS Artifact. The German version of the report will be available through AWS Artifact in the coming weeks. [email protected] – You can use this new feature of AWS Lambda to run Node.js functions across the global network of AWS locations without having to provision or manager servers, in order to deliver rich, personalized content to your users with low latency. Read [email protected] – Intelligent Processing of HTTP Requests at the Edge to learn more. We launched Amazon Elastic File System in production form a little over a year ago (see Amazon Elastic File System – Production Ready in Three Regions for more information). Later in the year we added On-Premises access via Direct Connect and made EFS available in the US East (Ohio) Region, following up this year with availability in the EU (Frankfurt) and Asia Pacific (Sydney) Regions. Today we are adding support for encryption of data at rest. When you create a new file system, you can select a key that will be used to encrypt the contents of the files that you store on the file system. The key can be a built-in key that is managed by AWS or a key that you created yourself using AWS Key Management Service (KMS). 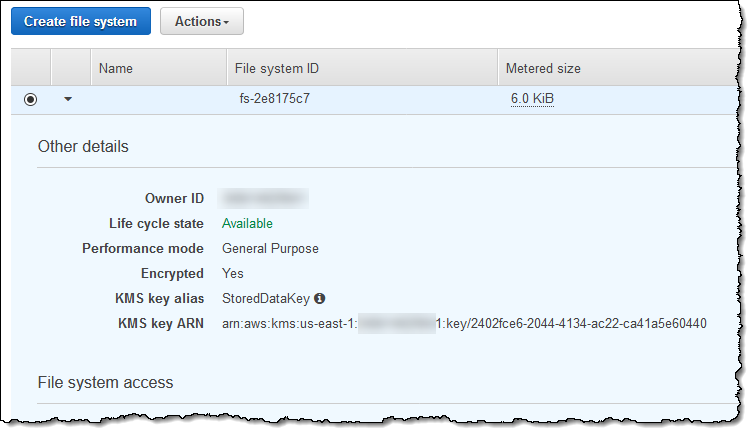 File metadata (file names, directory names, and directory contents) will be encrypted using a key managed by AWS. Both forms of encryption are implemented using an industry-standard AES-256 algorithm. A cryptographic algorithm that meets the approval of FIPS 140-2 is used to encrypt data and metadata. The encryption is transparent and has a minimal effect on overall performance. You can use AWS Identity and Access Management (IAM) to control access to the Customer Master Key (CMK). The CMK must be enabled in order to grant access to the file system; disabling the key prevents it from being used to create new file systems and blocks access (after a period of time) to existing file systems that it protects. To learn more about your options, read Managing Access to Encrypted File Systems. Encryption of data at rest is available now in all regions where EFS is supported, at no additional charge. AWS customers frequently use tags to organize their Amazon EC2 instances, Amazon EBS volumes, Amazon S3 buckets, and other resources. Over the past couple of years we have been working to make tagging more useful and more powerful. For example, we have added support for tagging during Auto Scaling, the ability to use up to 50 tags per resource, console-based support for the creation of resources that share a common tag (also known as resource groups), and the option to use Config Rules to enforce the use of tags. As customers grow to the point where they are managing thousands of resources, each with up to 50 tags, they have been looking to us for additional tooling and options to simplify their work. Today I am happy to announce that our new Resource Tagging API is now available. You can use these APIs from the AWS SDKs or via the AWS Command Line Interface (CLI). You now have programmatic access to the same resource group operations that had been accessible only from the AWS Management Console. 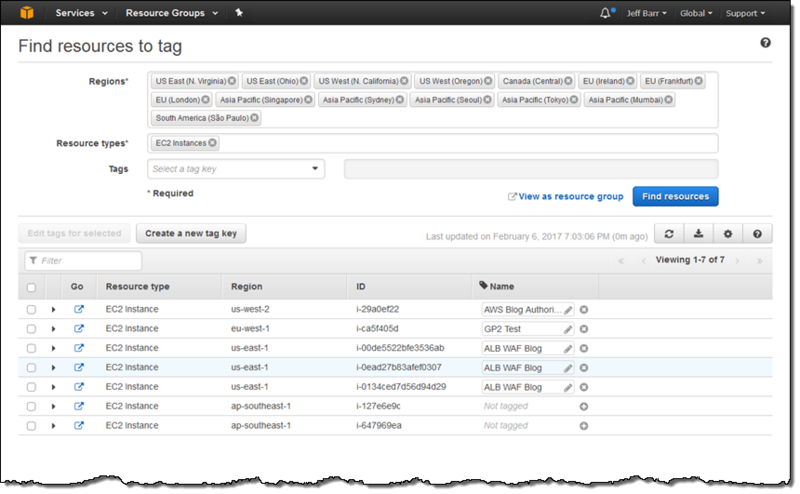 To learn more about this feature, read Resource Groups and Tagging for AWS. The API that we are announcing today gives you power to tag, untag, and locate resources using tags, all from your own code. With these new API functions, you are now able to operate on multiple resource types with a single set of functions. TagResources – Add tags to up to 20 resources at a time. UntagResources – Remove tags from up to 20 resources at a time. GetResources – Get a list of resources, with optional filtering by tags and/or resource types. GetTagKeys – Get a list of all of the unique tag keys used in your account. GetTagValues – Get all tag values for a specified tag key. Amazon EC2 AMI, Customer Gateway, DHCP Option, EBS Volume, Instance, Internet Gateway, Network ACL, Network Interface, Reserved Instance, Reserved Instance Listing, Route Table, Security Group – EC2 Classic, Security Group – VPC, Snapshot, Spot Batch, Spot Instance Request, Spot Instance, Subnet, Virtual Private Gateway, VPC, VPN Connection. Amazon Elastic File System Filesystem. Amazon Machine Learning Batch Prediction, Data Source, Evaluation, ML Model. Amazon Relational Database Service DB Instance, DB Option Group, DB Parameter Group, DB Security Group, DB Snapshot, DB Subnet Group, Event Subscription, Read Replica, Reserved DB Instance. Amazon Route 53 Domain, Health Check, Hosted Zone. AWS Storage Gateway Gateway, Virtual Tape, Volume. Elastic Load Balancing Load Balancer, Target Group. Compatibility – The older, service-specific functions remain available and you can continue to use them. Write Permission – The new tagging API adds another layer of permission on top of existing policies that are specific to a single AWS service. For example, you will need to have access to tag:tagResources and EC2:createTags in order to add a tag to an EC2 instance. Read Permission – You will need to have access to tag:GetResources, tag:GetTagKeys, and tag:GetTagValues in order to call functions that access tags and tag values. Pricing – There is no charge for the use of these functions or for tags. The new functions are supported by the latest versions of the AWS SDKs. You can use them to tag and access resources in all commercial AWS regions. This edition includes all of our announcements, content from all of our blogs, and as much community-generated AWS content as I had time for! We announced the AWS Health Tools Repository. We announced that you can now Send High-Volume SMS Messages from Dedicated Short Codes. We announced that Amazon Elastic File System Now Supports NFSv4 Lock Upgrading and Downgrading. We announced that Amazon SES Now Supports up to 10,000 Verified Identities. We updated the AWS Simple Monthly Calculator – it is now price accurate and region complete. We published customer success stories from : BidMotion, Iconosquare, The Met Office, Mojo Networks, MoveWORK, Porter Airlines, and Springworks. The AWS Java Blog announced that AWS Toolkit for Eclipse Now Supports Creation of Maven Projects for AWS, Lambda, and Serverless Applications. I looked back at Amazon RDS in 2016. The AWS Enterprise Blog shared Some Cloud Best Practices from iTMethods. The AWS Partner Network Blog talked about CloudHealth Technologies – Enabling Next-Generation MSPs. The AWS Government, Education, & Nonprofits Blog launched the Fourth City on a Cloud Innovation Challenge. 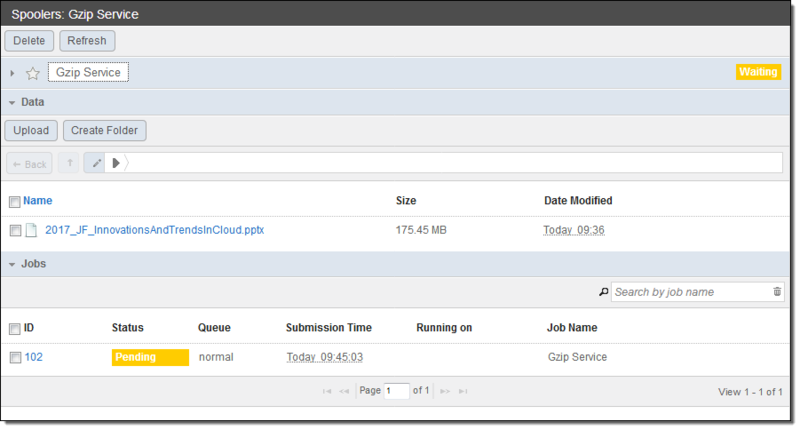 Cloudonaut continued their AWS Velocity series with an EC2-Based CI/CD Pipeline. DZone talked about The AWS Serverless API Portal. Trek10 showed you how to Schedule Calling Webhooks with Cron-Like Syntax in AWS Lambda. We announced that the AWS Database Migration Service has Processed 20,000 Migrations and Counting. We announced that Amazon Aurora Now Supports Cross-Account Encrypted Snapshot Sharing and Encryption Support for Globally Distributed Database Deployments. 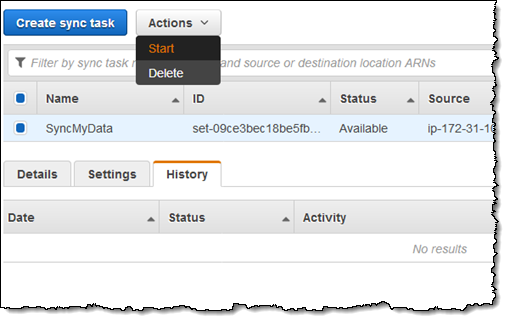 We announced that AWS Database Migration Service Now Supports Individual Table Reload. We announced a new AWS Direct Connection Location in Vienna. We announced that AWS Step Functions is Now Available in the EU (Frankfurt) Region. We announced that AWS IoT is Now Available in the EU (London) Region. We announced that AWS Directory Service for Microsoft Active Directory is Now Available in the Canada (Central) Region. The AWS Partner Network Blog announced that the Heptio Kubernetes on AWS Quick Start is Now Available. The Mechanical Turk Blog announced that Developers Can Now Use AWS SDKs to Access the MTurk API. 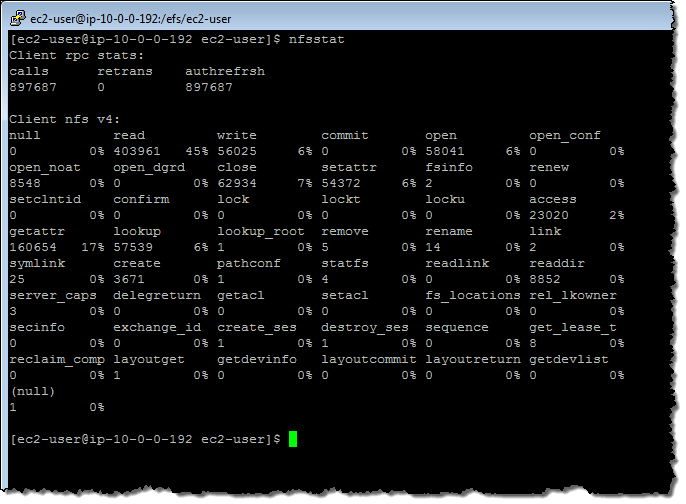 A two-part series on the AWS Compute Blog showed you how to Automate the Creation of Consistent Amazon EBS Snapshots with Amazon EC2 Systems Manager (Part 1, Part 2). The AWS Java Blog reminded you that Client Constructors are Now Deprecated in the AWS SDK for Java. The AWS Security Blog showed you How to Protect Your Web Application Against DDoS Attacks by Using Amazon Route 53 and an External Content Delivery Network. 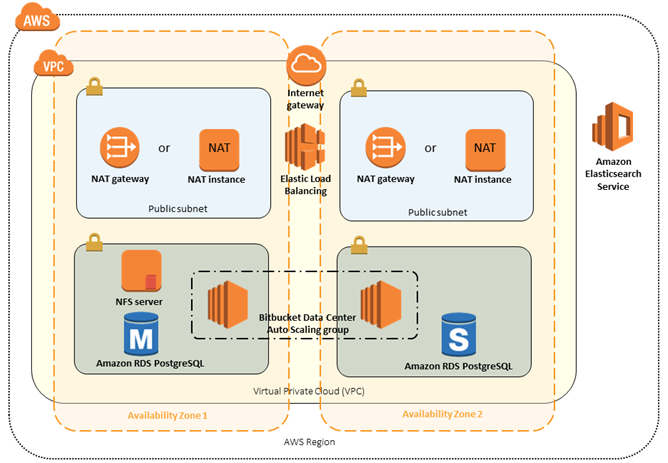 The AWS Government, Education, & Nonprofits Blog shared An Introduction to AWS for Nonprofits & NGOs. Twilio showed you how to Get Server Outage Alerts via SMS with AWS Lambda. Cloud Academy discussed Two Long-Awaited New Features in Amazon EC2. Flux7 explained how Mass AWS Migration Grows Developer Efficiency & Productivity with Self-Serve IT. nTh Among All spent some time Exploring AWS Organizations. We announced that Amazon AppStream Now Allows You to use CloudWatch to Monitor Your Fleets. We announced an Edge Location in Prague, Czech Republic. We announced that AWS CodePipeline Now Supports AWS CodeBuild as a Test Action. We announced that AWS Directory Service for Microsoft AD Simplifies On-Premises User Sign-in to the AWS Management Console. We announced Amazon EMR 5.4.0 and Support for R4 Instances. The AWS AI Blog announced that the Deep Learning AMI v2.0 is Now Available for Amazon Linux. 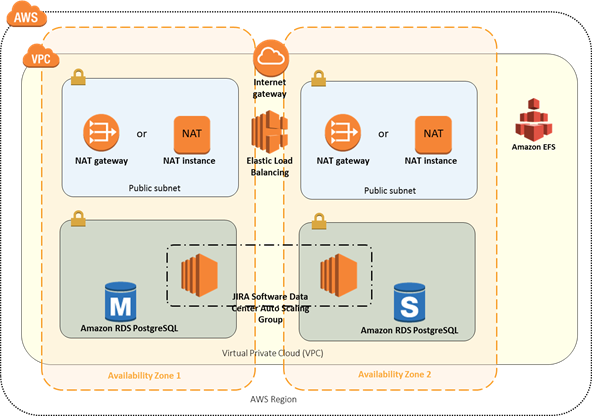 The AWS Database Blog talked about Using the Redis Geospatial Capbilities via Amazon ElastiCache. The AWS Enterprise Blog noted that Tenets Provide Essential Guidance on Your Cloud Journey. The AWS Big Data Blog announced Big Changes to the Big Data on AWS Training Course. The AWS Security Blog showed you How to Access the AWS Management Console Using AWS Microsoft AD and Your On-Premises Credentials. CloudHealth listed Four Steps to Understanding the TCO of Migrating a Workload to AWS. Gorillastack discussed the AWS Lambda IteratorAge Metric for Increased Processing Operations Visibility. We announced that Amazon SES Can Now Automatically Warm Up Your Dedicated IP Addresses. We announced that Amazon Cognito is Now Available in the EU (London) Region. We announced that Amazon API Gateway Now Integrates with AWS Certificate Manager. 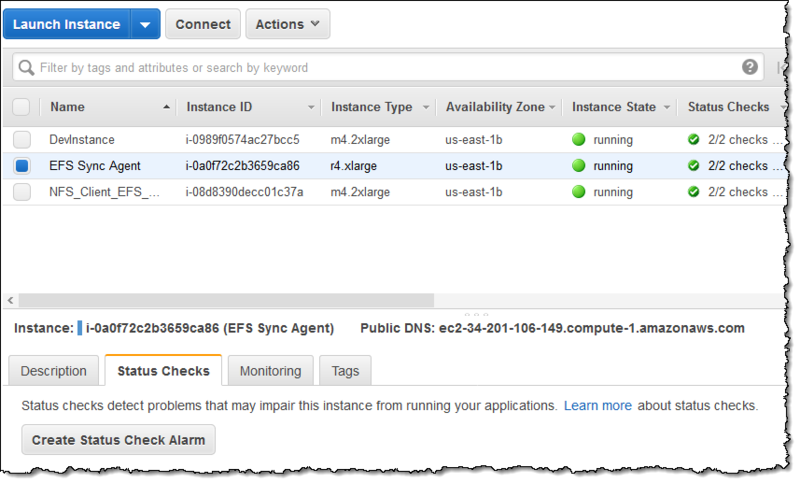 We announced that EC2 Rescue is Now Available. We added Ten New Service Limit Checks, AuroraDB Availability, and EC2 Windows Checks to AWS Trusted Advisor. We published a View From the Floor of HIMSS as part of our focus on AWS and Healthcare. 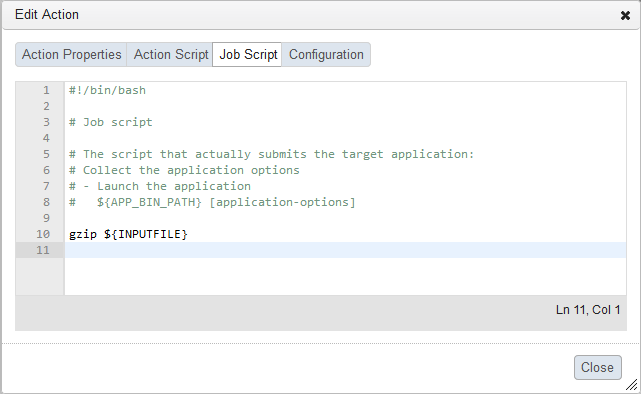 The AWS Compute Blog showed you how to Create a Simple “Fetch & Run” AWS Batch Job. The AWS AI Blog showed you how to Predict Customer Churn with Amazon Machine Learning. The AWS Big Data Blog showed you how to Analyze VPC Flow Logs with Amazon Kinesis Firehose, Amazon Athena, and Amazon QuickSight. The AWS Security Blog explained how the New Cloud Directory API Makes it Easier to Query Data Along Multiple Dimensions. Stelligent talked about Using Parameter Store with AWS CodePipeline. Botmetric announced the Botmetric Smart RI for AWS Reserved Instance Management. CloudCheckr announced Multiple New Reports for Multiple Account Views. Gathering Clouds explained How to Migrate to AWS in 30 Days. We announced that Amazon Aurora is Now Available in the US West (N. California) Region. We announced that Amazon Aurora Now Supports T2.Small Instances. CloudHealth shared The 3 “R’s” of Lowering AWS Costs. DZone shared CloudFormation Templates: ECS Cluster and Service, Legacy VPC Wrapper, and Automated Tests. DZone published AWS Timeouts: A Detective Story. DZone talked about Serverless Development With Node.js, AWS Lambda, and MongoDB Atlas. I introduced you to Amazon Elastic File System last year (Amazon Elastic File System – Shared File Storage for Amazon EC2) and announced production readiness earlier this year (Amazon Elastic File System – Production-Ready in Three Regions). Since the launch earlier this year, thousands of AWS customers have used it to set up, scale, and operate shared file storage in the cloud. Today we are making EFS even more useful with the introduction of simple and reliable on-premises access via AWS Direct Connect. This has been a much-requested feature and I know that it will be useful for migration, cloudbursting, and backup. To use this feature for migration, you simply attach an EFS file system to your on-premises servers, copy your data to it, and then process it in the cloud as desired, leaving your data in AWS for the long term. For cloudbursting, you would copy on-premises data to an EFS file system, analyze it at high speed using a fleet of Amazon Elastic Compute Cloud (EC2) instances, and then copy the results back on-premises or visualize them in Amazon QuickSight. You’ll get the same file system access semantics including strong consistency and file locking, whether you access your EFS file systems from your on-premises servers or from your EC2 instances (of course, you can do both concurrently). You will also be able to enjoy the same multi-AZ availability and durability that is part-and-parcel of EFS. This feature is available today at no extra charge in the US East (Northern Virginia), US West (Oregon), EU (Ireland), and US East (Ohio) Regions. Today, AWS Identity and Access Management (IAM) made 10 AWS managed policies available that align with common job functions in organizations. AWS managed policies enable you to set permissions using policies that AWS creates and manages, and with a single AWS managed policy for job functions, you can grant the permissions necessary for network or database administrators, for example. 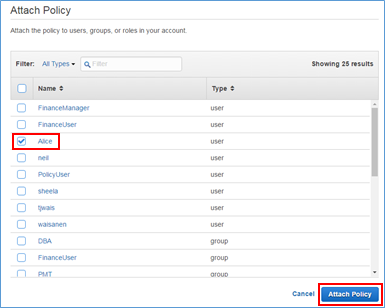 You can attach multiple AWS managed policies to your users, roles, or groups if they span multiple job functions. As with all AWS managed policies, AWS will keep these policies up to date as we introduce new services or actions. You can use any AWS managed policy as a template or starting point for your own custom policy if the policy does not fully meet your needs (however, AWS will not automatically update any of your custom policies). 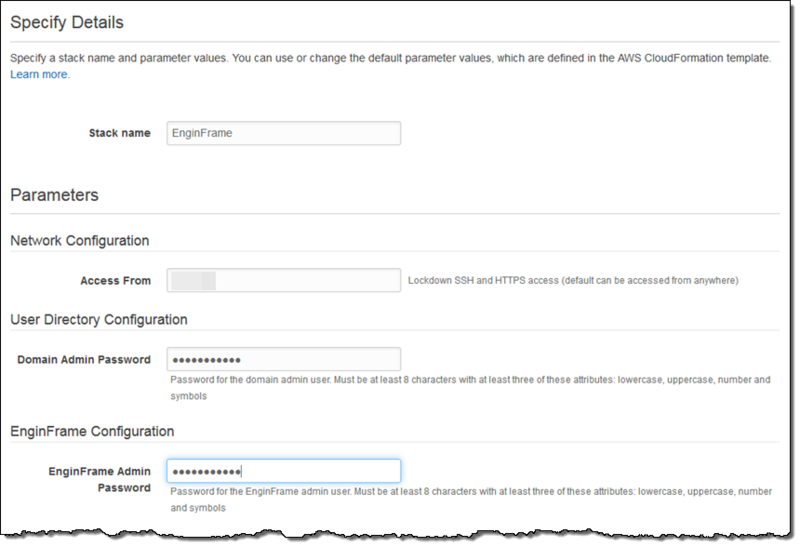 In this blog post, I introduce the new AWS managed policies for job functions and show you how to use them to assign permissions. The following table lists the new AWS managed policies for job functions and their descriptions. Administrator This policy grants full access to all AWS services. Billing This policy grants permissions for billing and cost management. These permissions include viewing and modifying budgets and payment methods. 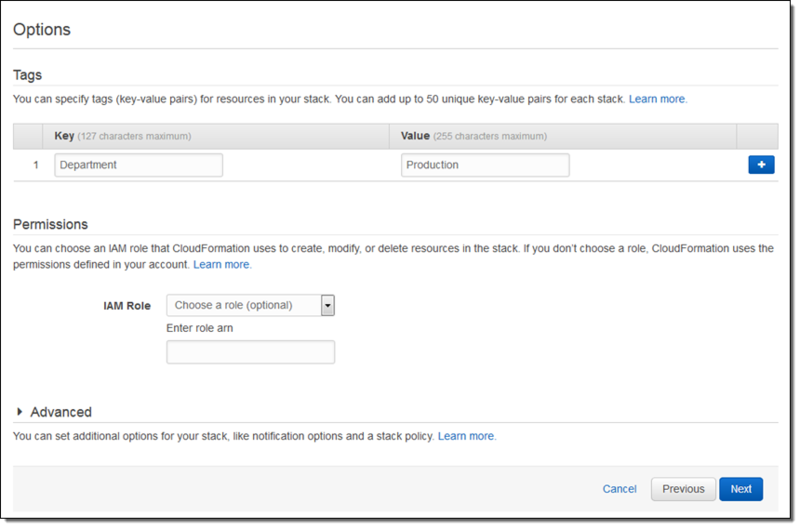 An additional step is required to access the AWS Billing and Cost Management pages after assigning this policy. Data Scientist This policy grants permissions for data analytics and analysis. Access to the following AWS services is a part of this policy: Amazon Elastic Map Reduce, Amazon Redshift, Amazon Kinesis, Amazon Machine Learning, Amazon Data Pipeline, Amazon S3, and Amazon Elastic File System. This policy additionally enables you to use optional IAM service roles to leverage features in other AWS services. To grant such access, you must create a role for each of these services. Database Administrator This policy grants permissions to all AWS database services. Access to the following AWS services is a part of this policy: Amazon DynamoDB, Amazon ElastiCache, Amazon RDS, and Amazon Redshift. This policy additionally enables you to use optional IAM service roles to leverage features in other AWS services. To grant such access, you must create a role for each of these services. Developer Power User This policy grants full access to all AWS services except for IAM. Network Administrator This policy grants permissions required for setting up and configuring network resources. Access to the following AWS services is included in this policy: Amazon Route 53, Route 53 Domains, Amazon VPC, and AWS Direct Connect. This policy grants access to actions that require delegating permissions to CloudWatch Logs. This policy additionally enables you to use optional IAM service roles to leverage features in other AWS services. To grant such access, you must create a role for this service. Security Auditor This policy grants permissions required for configuring security settings and for monitoring events and logs in the account. 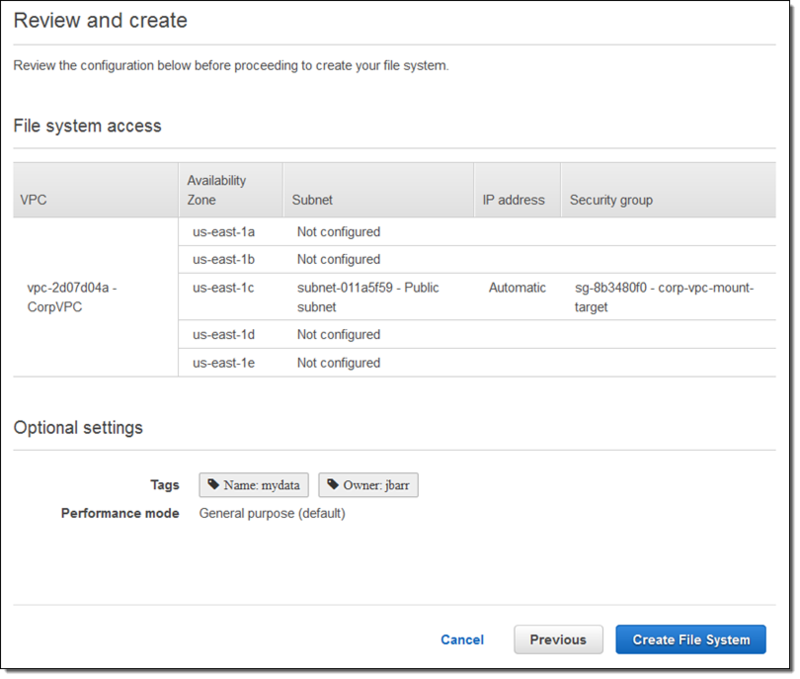 Support User This policy grants permissions to troubleshoot and resolve issues in an AWS account. This policy also enables the user to contact AWS support to create and manage cases. System Administrator This policy grants permissions needed to support system and development operations. Access to the following AWS services is included in this policy: AWS CloudTrail, Amazon CloudWatch, CodeCommit, CodeDeploy, AWS Config, AWS Directory Service, EC2, IAM, AWS KMS, Lambda, RDS, Route 53, S3, SES, SQS, AWS Trusted Advisor, and Amazon VPC. This policy grants access to actions that require delegating permissions to EC2, CloudWatch, Lambda, and RDS. This policy additionally enables you to use optional IAM service roles to leverage features in other AWS services. To grant such access, you must create a role for each of these services. 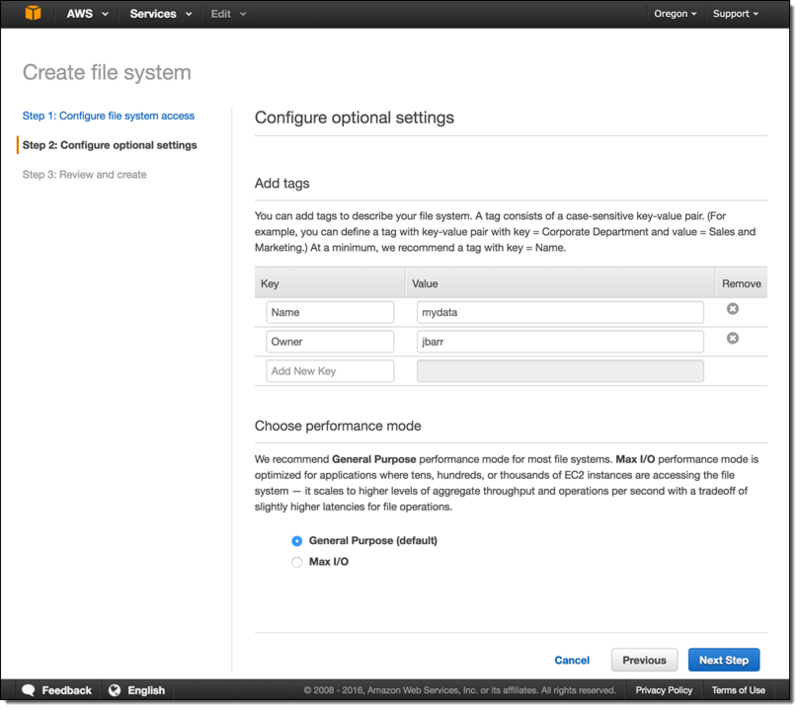 View Only User This policy grants permissions to view existing resources across all AWS services within an account. Some of the policies in the preceding table enable you to take advantage of additional features that are optional. These policies grant access to iam:passrole, which passes a role to delegate permissions to an AWS service to carry out actions on your behalf. 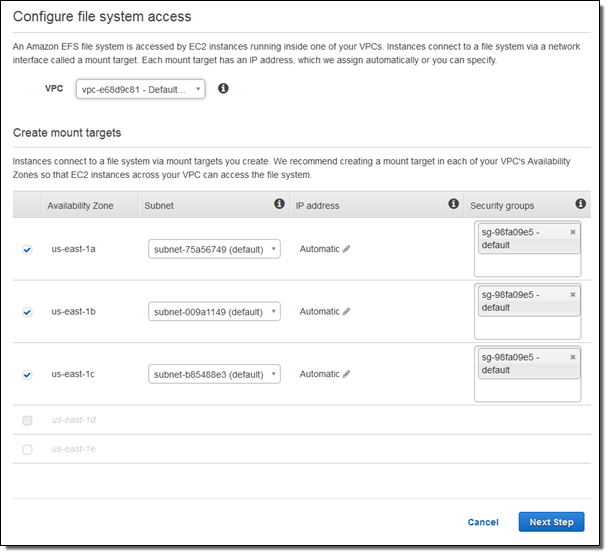 For example, the Network Administrator policy passes a role to CloudWatch’s flow-logs-vpc so that a network administrator can log and capture IP traffic for all the Amazon VPCs they create. You must create IAM service roles to take advantage of the optional features. To follow security best practices, the policies already include permissions to pass the optional service roles with a naming convention. This avoids escalating or granting unnecessary permissions if there are other service roles in the AWS account. If your users require the optional service roles, you must create a role that follows the naming conventions specified in the policy and then grant permissions to the role. For example, your system administrator may want to run an application on an EC2 instance, which requires passing a role to Amazon EC2. The system administrator policy already has permissions to pass a role named ec2-sysadmin-*. When you create a role called ec2-sysadmin-example-application, for example, and assign the necessary permissions to the role, the role is passed automatically to the service and the system administrator can start using the features. The documentation summarizes each of the use cases for each job function that requires delegating permissions to another AWS service. Let’s say that your company is new to AWS, and you have an employee, Alice, who is a database administrator. You want Alice to be able to use and manage all the database services while not giving her full administrative permissions. In this scenario, you can use the Database Administrator AWS managed policy. This policy grants view, read, write, and admin permissions for RDS, DynamoDB, Amazon Redshift, ElastiCache, and other AWS services a database administrator might need. The Database Administrator policy passes several roles for various use cases. The following policy shows the different service roles that are applicable to a database administrator. However, in order for user Alice to be able to leverage any of the features that require another service, you must create a service role and grant it permissions. In this scenario, Alice wants only to monitor RDS databases. To enable Alice to monitor RDS databases, you must create a role called rds-monitoring-role and assign the necessary permissions to the role. Sign in to the IAM console. In the left pane, choose Policies and type database in the Filter box. Choose the Database Administrator policy, and then choose Attach in the Policy Actions drop-down menu. Choose the user (in this case, I choose Alice), and then choose Attach Policy. User Alice now has Database Administrator permissions. However, for Alice to monitor RDS databases, you must create a role called rds-monitoring-role. To do this, in the left pane, choose Roles, and then choose Create New Role. For the Role Name, type rds-monitoring-role to match the name that is specified in the Database Administrator. Choose Next Step. 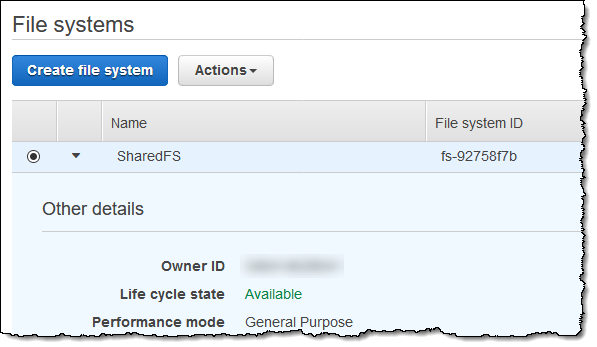 In the AWS Service Roles section, scroll down and choose Amazon RDS Role for Enhanced Monitoring. Choose the AmazonRDSEnhancedMonitoringRole policy and then choose Select. After reviewing the role details, choose Create Role. User Alice now has Database Administrator permissions and can now monitor RDS databases. To use other roles for the Database Administrator AWS managed policy, see the documentation. To learn more about AWS managed policies for job functions, see the IAM documentation. If you have comments about this post, submit them in the “Comments” section below. If you have questions about these new policies, please start a new thread on the IAM forum. As part of our ongoing plan to expand the AWS footprint, I am happy to announce that our new US East (Ohio) Region is now available. In conjunction with the existing US East (Northern Virginia) Region, AWS customers in the Eastern part of the United States have fast, low-latency access to the suite of AWS infrastructure services. The new Ohio Region supports Amazon Elastic Compute Cloud (EC2) and related services including Amazon Elastic Block Store (EBS), Amazon Virtual Private Cloud, Auto Scaling, Elastic Load Balancing, NAT Gateway, Spot Instances, and Dedicated Hosts. It also supports (deep breath) Amazon API Gateway, Amazon Aurora, AWS Certificate Manager (ACM), AWS CloudFormation, Amazon CloudFront, AWS CloudHSM, Amazon CloudWatch (including CloudWatch Events and CloudWatch Logs), AWS CloudTrail, AWS CodeCommit, AWS CodeDeploy, AWS CodePipeline, AWS Config, AWS Database Migration Service, AWS Direct Connect, Amazon DynamoDB, EC2 Container Registy, Amazon ECS, Amazon Elastic File System, Amazon ElastiCache, AWS Elastic Beanstalk, Amazon EMR, Amazon Elasticsearch Service, Amazon Glacier, AWS Identity and Access Management (IAM), AWS Import/Export Snowball, AWS Key Management Service (KMS), Amazon Kinesis, AWS Lambda, AWS Marketplace, Mobile Hub, AWS OpsWorks, Amazon Relational Database Service (RDS), Amazon Redshift, Amazon Route 53, Amazon Simple Storage Service (S3), AWS Service Catalog, Amazon Simple Notification Service (SNS), Amazon Simple Queue Service (SQS), AWS Storage Gateway, Amazon Simple Workflow Service (SWF), AWS Trusted Advisor, VM Import/Export, and AWS WAF. The Region supports all sizes of C4, D2, I2, M4, R3, T2, and X1 instances. As is the case with all of our newer Regions, instances must be launched within a Virtual Private Cloud (read Virtual Private Clouds for Everyone to learn more). 12 ms to IAD (home of the US East (Northern Virginia) Region). 20 ms to JFK (home to an Internet exchange point). 29 ms to ORD (home to a pair of Direct Connect locations hosted by QTS and Equinix and another exchange point). 91 ms to SFO (home of the US West (Northern California) Region). With just 12 ms of round-trip latency between US East (Ohio) and US East (Northern Virginia), you can make good use of unique AWS features such as S3 Cross-Region Replication, Cross-Region Read Replicas for Amazon Aurora, Cross-Region Read Replicas for MySQL, and Cross-Region Read Replicas for PostgreSQL. Data transfer between the two Regions is priced at the Inter-AZ price ($0.01 per GB), making your cross-region use cases even more economical. Also on the networking front, we have agreed to work together with Ohio State University to provide AWS Direct Connect access to OARnet. This 100-gigabit network connects colleges, schools, medical research hospitals, and state government across Ohio. This connection provides local teachers, students, and researchers with a dedicated, high-speed network connection to AWS. Today’s launch of this 3-AZ Region expands our global footprint to a grand total of 14 Regions and 38 Availability Zones. We are also getting ready to open up a second AWS Region in China, along with other new AWS Regions in Canada, France, and the UK. Since there’s been some industry-wide confusion about the difference between Regions and Availability Zones of late, I think it is important to understand the differences between these two terms. Each Region is a physical location where we have one or more Availability Zones or AZs. Each Availability Zone, in turn, consists of one or more data centers, each with redundant power, networking, and connectivity, all housed in separate facilities. Having two or more AZ’s in each Region gives you the ability to run applications that are more highly available, fault tolerant, and durable than would be the case if you were limited to a single AZ. Around the office, we sometimes play with analogies that can serve to explain the difference between the two terms. My favorites are “Hotels vs. hotel rooms” and “Apple trees vs. apples.” So, pick your analogy, but be sure that you know what it means! The AWS Quick Starts help you to rapidly deploy reference implementations of software solutions on the AWS Cloud. You can use the Quick Starts to easily test drive and consume software while taking advantage of best practices promoted by AWS and the software partner. Today I would like to tell you about a pair of Quick Start guides that were developed in collaboration with APN Advanced Technology Partner (and DevOps competency holder) Atlassian to help you to deploy their JIRA Software Data Center and Bitbucket Data Center on AWS. Atlassian’s Data Center offerings are designed for customers that have large development teams and a need for scalable, highly available development and project management tools. Because these tools are invariably mission-critical, robustness and resilience are baseline requirements, production deployments are always run in a multi-node or cluster configuration. JIRA Software Data Center is a project and issue management solution for agile teams and Bitbucket Data Center is a Git repository solution, both of which provide large teams working on multiple projects with high availability and performance at scale. With these two newly introduced Atlassian Quick Starts, you have access to a thoroughly tested, fully supported reference architecture that greatly simplifies and accelerates the deployment of these products on AWS. 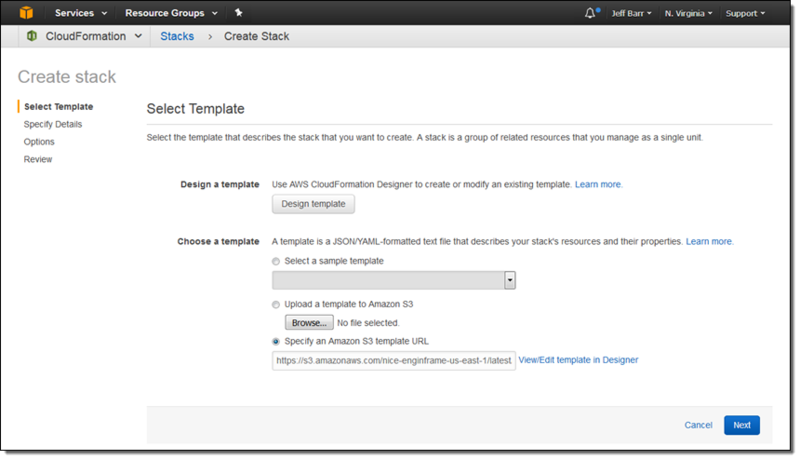 The Quick Starts include AWS CloudFormation templates that allow you deploy Bitbucket and/or JIRA Software into a new or existing Virtual Private Cloud (VPC). If you want to use a new VPC, the template will create it, along with public and private subnets and a NAT Gateway to allow EC2 instances in the private subnet to connect to the Internet (in regions where the NAT Gateway is not available, the template will create a NAT instance instead). If you are already using AWS and have a suitable VPC, you can deploy JIRA Software Data Center and Bitbucket Data Center there instead. You will need to sign up for evaluation licenses for the Atlassian products that you intend to launch. Amazon RDS PostgreSQL – Bitbucket Data Center requires a supported external database. Amazon RDS for PostgreSQL in a Multi-AZ configuration allows failover in the event the master node fails. NFS Server – Bitbucket Data Center uses a shared file system to store the repositories in a common location that is accessible to multiple Bitbucket nodes. 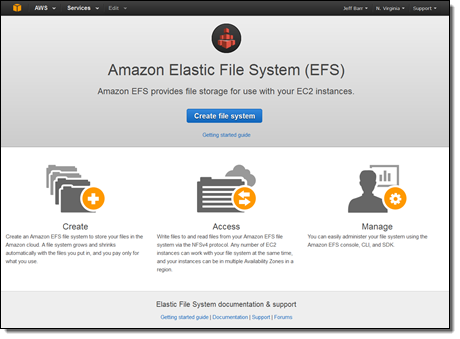 The Quick Start architecture implements the shared file system in an EC2 instance with an attached Amazon Elastic Block Store (EBS) volume. Bitbucket Auto Scaling Group – The Bitbucket Data Center product is installed on Amazon Elastic Compute Cloud (EC2) instances in an Auto Scaling group. The deployment will scale out and in, based on utilization. Amazon Elasticsearch Service – Bitbucket Data Center uses Elasticsearch for indexing and searching. The Quick Start architecture uses Amazon Elasticsearch Service, a managed service that makes it easy to deploy, operate, and scale Elasticsearch in the AWS Cloud. 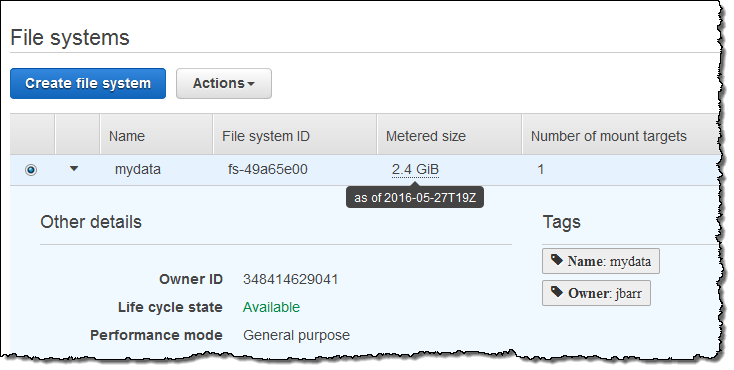 Amazon RDS PostgreSQL – JIRA Data Center requires a supported external database. Amazon RDS for PostgreSQL in a Multi-AZ configuration allows failover in the event the master node fails. 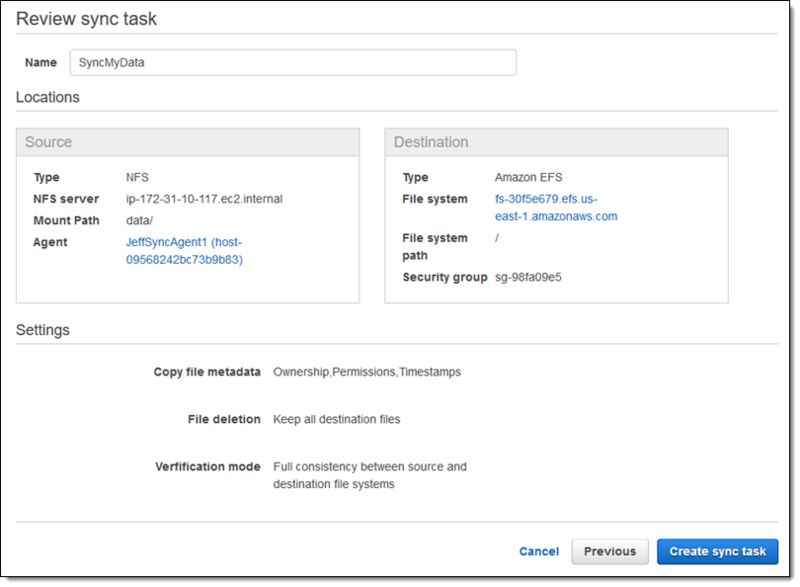 Amazon Elastic File System – JIRA Software Data Center uses a shared file system to store artifacts in a common location that is accessible to multiple JIRA nodes. The Quick Start architecture implements a highly available shared file system using Amazon Elastic File System. 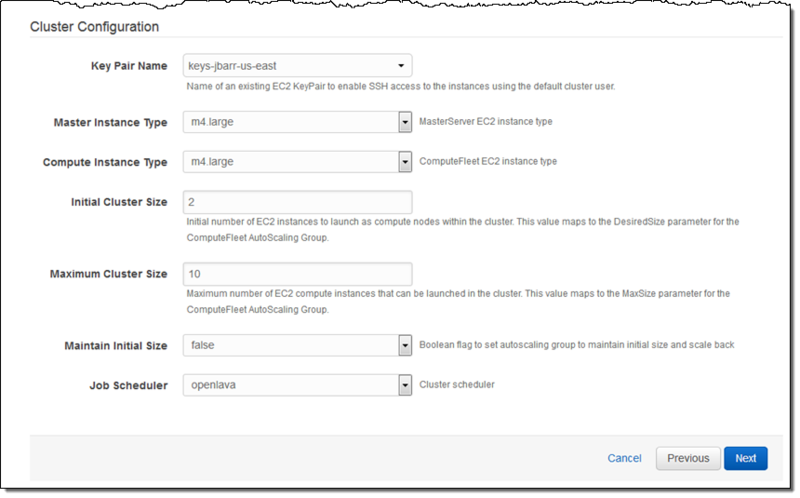 JIRA Auto Scaling Group – The JIRA Data Center product is installed on Amazon Elastic Compute Cloud (EC2) instances in an Auto Scaling group. The deployment will scale out and in, based on utilization. We will continue to work with Atlassian to update and refine these two new Quick Starts. We’re also working on two additional Quick Starts for Atlassian Confluence and Atlassian JIRA Service Desk and hope to have them ready before AWS re:Invent. To get started, please visit the Bitbucket Data Center Quick Start or the JIRA Software Data Center Quick Start. You can also head over to Atlassian’s Quick Start page. The templates are available today; give them a whirl and let us know what you think! The portfolio of AWS storage products has grown increasingly rich and diverse over time. Amazon S3 started out with a single storage class and has grown to include storage classes for regular, infrequently accessed, and archived objects. Similarly, Amazon Elastic Block Store (EBS) began with a single volume type and now offers a choice of four types of SAN-style block storage, each designed to be a great for a particular set of access patterns and data types. With object storage and block storage capably addressed by S3 and EBS, we turned our attention to the file system. We announced the Amazon Elastic File System (EFS) last year in order to provide multiple EC2 instances with shared, low-latency access to a fully-managed file system. I am happy to announce that EFS is now available for production use in the US East (Northern Virginia), US West (Oregon), and Europe (Ireland) Regions. We are launching today after an extended preview period that gave us insights into an extraordinarily wide range of customer use cases. The EFS preview was a great fit for large-scale, throughput-heavy processing workloads, along with many forms of content and web serving. During the preview we received a lot of positive feedback about the performance of EFS for these workloads, along with requests to provide equally good support for workloads that are sensitive to latency and/or make heavy use of file system metadata. We’ve been working to address this feedback and today’s launch is designed to handle a very wide range of use cases. Based on what I have heard so far, our customers are really excited about EFS and plan to put it to use right away. Many AWS customers have asked us for a way to more easily manage file storage on a scalable basis. Some of these customers run farms of web servers or content management systems that benefit from a common namespace and easy access to a corporate or departmental file hierarchy. Others run HPC and Big Data applications that create, process, and then delete many large files, resulting in storage utilization and throughput demands that vary wildly over time. Our customers also insisted on high availability, and durability, along with a strongly consistent model for access and modification. 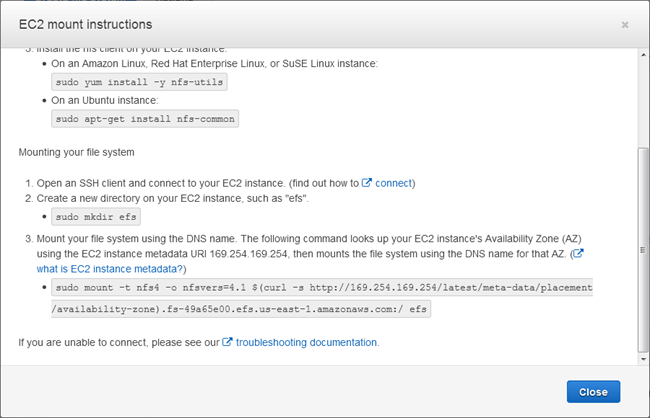 EFS lets you create POSIX-compliant file systems and attach them to one or more of your EC2 instances via NFS. The file system grows and shrinks as necessary (there’s no fixed upper limit and you can grow to petabyte scale) and you don’t pre-provision storage space or bandwidth. You pay only for the storage that you use. EFS protects your data by storing copies of your files, directories, links, and metadata in multiple Availability Zones. In order to provide the performance needed to support large file systems accessed by multiple clients simultaneously, Elastic File System performance scales with storage (I’ll say more about this later). Each Elastic File System is accessible from a single VPC, and is accessed by way of mount targets that you create within the VPC. 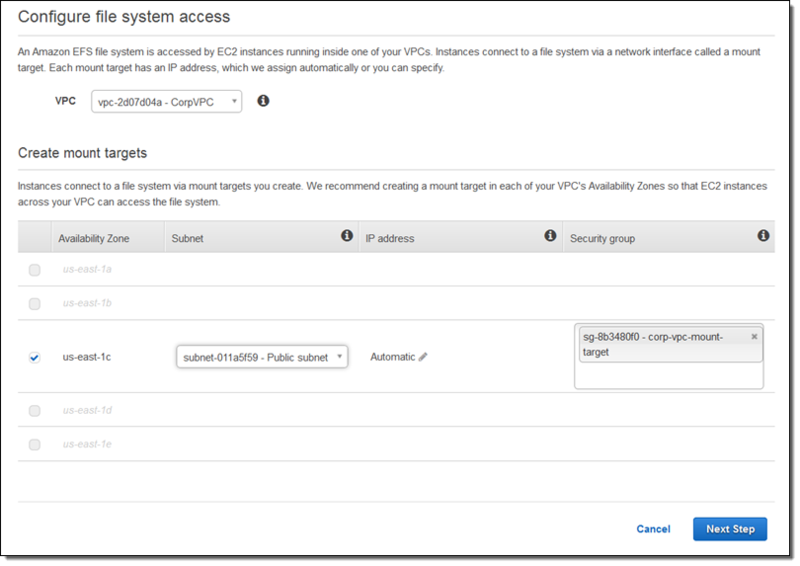 You have the option to create a mount target in any desired subnet of your VPC. Access to each mount target is controlled, as usual, via Security Groups. EFS offers two distinct performance modes. The first mode, General Purpose, is the default. 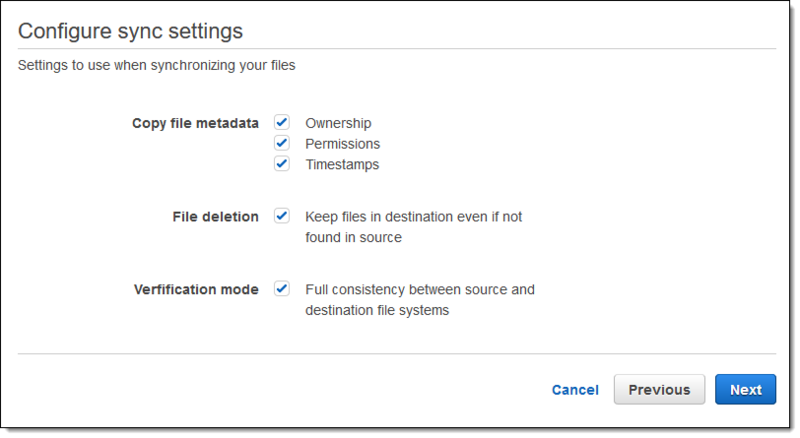 You should use this mode unless you expect to have tens, hundreds, or thousands of EC2 instances access the file system concurrently. The second mode, Max I/O, is optimized for higher levels of aggregate throughput and operations per second, but incurs slightly higher latencies for file operations. In most cases, you should start with general purpose mode and watch the relevant CloudWatch metric (PercentIOLimit). When you begin to push the I/O limit of General Purpose mode, you can create a new file system in Max I/O mode, migrate your files, and enjoy even higher throughput and operations per second. It is very easy to create, mount, and access an Elastic File System. I used the AWS Management Console; I could have used the EFS API, the AWS Command Line Interface (CLI), or the AWS Tools for Windows PowerShell as well. BurstCreditBalance – The amount of data that can be transferred at the burst level of throughput. ClientConnections – The number of clients that are connected to the file system. DataReadIOBytes – The number of bytes read from the file system. DataWriteIOBytes -The number of bytes written to the file system. MetadataIOBytes – The number of bytes of metadata read and written. TotalIOBytes -The sum of the preceding three metrics. PermittedThroughput -The maximum allowed throughput, based on file system size. PercentIOLimit – The percentage of the available I/O utilized in General Purpose mode. The throughput available to each of your EFS file systems will grow as the file system grows. Because file-based workloads are generally spiky, with demands for high levels of throughput for short amounts of time and low levels the rest of the time, EFS is designed to burst to high throughput levels on an as-needed basis. All file systems can burst to 100 MB per second of throughput. Those over 1 TB can burst to an additional 100 MB per second for each TB stored. For example, a 2 TB file system can burst to 200 MB per second and a 10 TB file system can burst to 1,000 MB per second of throughput. File systems larger than 1 TB can always burst for 50% of the time if they are inactive for the other 50%. EFS uses a credit system to determine when a file system can burst. Each one accumulates credits at a baseline rate (50 MB per TB of storage) that is determined by the size of the file system, and spends them whenever it reads or writes data. The accumulated credits give the file system the ability to drive throughput beyond the baseline rate. A 100 GB file system can burst up to 100 MB per second for up to 72 minutes each day, or drive up to 5 MB per second continuously. A 10 TB file system can burst up to 1 GB per second for 12 hours each day, or drive 500 MB per second continuously. To learn more about how the credit system works, read about File System Performance in the EFS documentation. Average I/O Size – The work associated with managing the metadata associated with small files via the NFS protocol, coupled with the work that EFS does to make your data highly durable and highly available, combine to create some per-operation overhead. In general, overall throughput will increase in concert with the average I/O size since the per-operation overhead is amortized over a larger amount of data. Also, reads will generally be faster than writes. Simultaneous Connections – Each EFS file system can accommodate connections from thousands of clients. Environments that can drive highly parallel behavior (from multiple EC2 instances) will benefit from the ability that EFS has to support a multitude of concurrent operations. Request Model – If you enable asynchronous writes to the file system by including the async option at mount time, pending writes will be buffered on the instance and then written to EFS asynchronously. Accessing a file system that has been mounted with the sync option or opening files using an option that bypasses the cache (e.g. O_DIRECT) will, in turn, issue synchronous requests to EFS. NFS Client Configuration – Some NFS clients use laughably small (by today’s standards) values for the read and write buffers by default. Consider increasing it to 1 MiB (again, this is an option to the mount command). 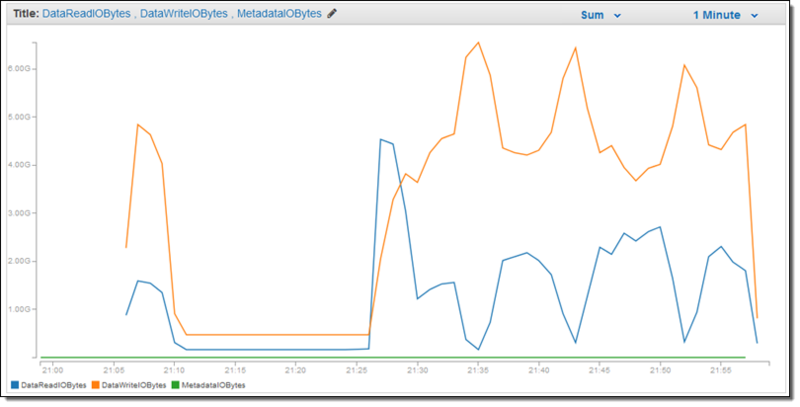 You can use an NFS 4.0 or 4.1 client with EFS; the latter will provide better performance. EC2 Instances – Applications that perform large amounts of I/O sometimes require a large amount of memory and/or compute power as well. Be sure that you have plenty of both; choose an appropriate instance size and type. If you are performing asynchronous reads and writes, the kernel use additional memory for caching. As a side note, the performance characteristics of EFS file systems are not dependent on the use of EBS-optimized instances. Benchmarking of file systems is a blend of art and science. Make sure that you use mature, reputable tools, run them more than once, and make sure that you examine your results in light of the considerations listed above. You can also find some detailed data regarding expected performance on the Amazon Elastic File System page. EFS is available now in the US East (Northern Virginia), US West (Oregon), and Europe (Ireland) Regions and you can start using it today. Pricing is based on the amount of data that you store, sampled several times per day and charged by the Gigabyte-month, pro-rated as usual, starting at $0.30 per GB per month in the US East (Northern Virginia) Region. There are no minimum fees and no setup costs (see the EFS Pricing page for more information). If you are eligible for the AWS Free Tier, you can use up to 5 GB of EFS storage per month at no charge.